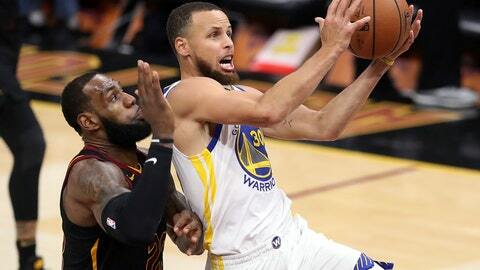 NBA fans will get a smorgasbord of LeBron James in a Los Angeles Lakers uniform, the All-Star laden lineup of the defending champion Golden State Warriors, the Houston Rockets and the up-and-coming Boston Celtics as part of the league’s national television schedule. The NBA released its TV schedule for the first week of the season, Christmas Day and Martin Luther King Jr. Day on Wednesday, and all are prominently featured. James Harden and the Rockets will appear three times on national television in the opening week of the season, while Lakers, Warriors and Celtics will be featured twice. The highlight of the coveted Christmas Day games is James facing a familiar foe — Stephen Curry and the Warriors — for a fourth straight year, only this time James will be wearing Lakers’ gold and purple rather than the familiar wine and gold colors of the Cleveland Cavaliers. The Warriors, who added center DeMarcus Cousins in the offseason, feature a lineup with five current NBA All-Stars. The other Christmas Day games include Kyrie Irving and the Celtics hosting the young, but talented Philadelphia 76ers. The Rockets, who came within a game of knocking off the Warriors in the Western Conference finals last season, will host the Oklahoma City Thunder, while Giannis Antetokounmpo and the Milwaukee Bucks visit the New York Knicks and the Portland Trail Blazers visit the Utah Jazz. The featured MLK day games includes a Warriors-Lakers rematch — this time in Los Angeles — while the 76ers host the Rockets, and Anthony Davis and the New Orleans Pelicans visit the Memphis Grizzles. The NBA season begins Oct. 16 with TNT televising the 76ers at the Celtics and the Thunder at the Warriors. The Pelicans visit the Rockets and Mavericks face the Suns on Oct. 17 on ESPN. On Oct. 18, the Bulls travel to face the 76ers and the Lakers visit the Trail Blazers, which both games on TNT. The Celtics will visit the Raptors on Oct. 19, while the Jazz host the Warriors on ESPN. The first nationally televised weekend games include the Raptors at the Washington Wizards on NBA TV and Rockets-Lakers Oct. 20 on ESPN, and the Rockets-Los Angeles Clippers Oct. 21 on NBA TV. The Bucks and Knicks get things going on Christmas day at noon Eastern on ESPN, followed by the Thunder-Rockets at 3 p.m. and 76ers-Celtics at 5:30 p.m. on ABC. The night games include Lakers-Warriors at 8 p.m. on ABC/ESPN capped by the Trail Blazers-Jazz at 10:30 p.m. on ESPN. The three nationally televised games on Jan. 21 include the Pelicans-Grizzlies, Rockets-76ers and Warriors-Lakers. Those games are on TNT.